Today’s recipe is very easy and very tasty. Every time that I am in a rush I go buy these three ingredients and start cooking, in our case we are students and we always look for fast and cheap ways to cook. 2 big chicken legs or in case you want more you can use a whole chicken or even more potatoes depending for how many people you are cooking for. And what matters the most spices!!! How to prepare it: Put the chicken in a big pot filled with water, some salt/pepper and leave to boil up to 10-15 minutes. Meanwhile cut the potatoes in squares, not very small because during the baking they will shrink. While the onion you can cut it as small as possible. In a baking pen you put the potatoes, onions, pepper, chilli, salt, garlic and whatever you want (spices). You mix it all together so the spices mix as well and taste like one. Take the pot with the boiling water and the chicken. 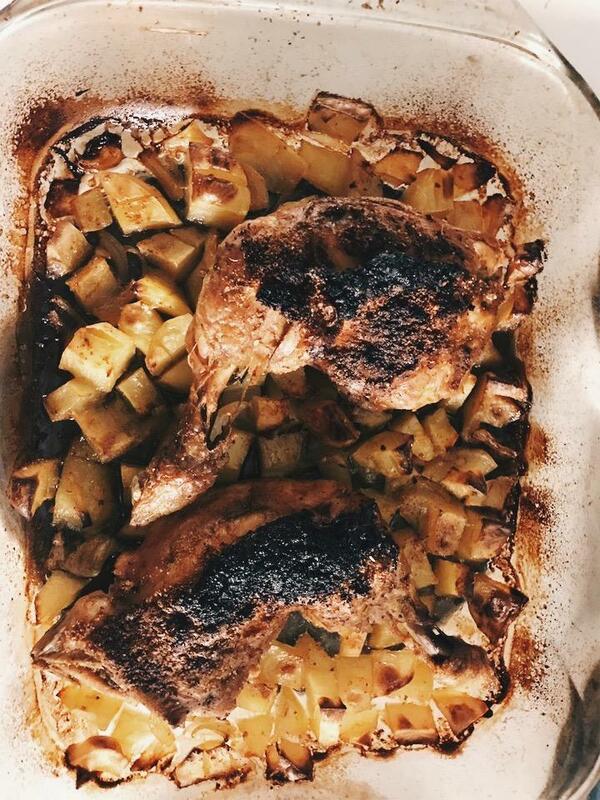 Put the chicken on top of the potatoes and the onion. Be careful, do mot through the water! Use it and put some of it in the baking pot, because it makes the potatoes softer and tastier because of the chicken juice. All of these together you put in the oven which is 250 degrees. Check the chicken once in a while until the top of it becomes crunchy and crispy. Usually it takes up to 25-30 minutes. There you have it a cheap, fast, but delicious meal!